When Louie has the opportunity to nurse a struggling new born miniature donkey back to health, he doesn't let his not-so-successful track record discourage him. He names the donkey Winslow, and despite the pessimistic outlook of family and friends around him, Louie dedicates himself to making sure Winslow grows to be strong and healthy. But this story is about much more than a boy nursing a donkey back to health. It's a story of a growing friendship between Louie and his new friend Nora. It's a story about family bonds that stay strong over long distances. It's a story about defying the odds, and being neighborly, and learning to let go. 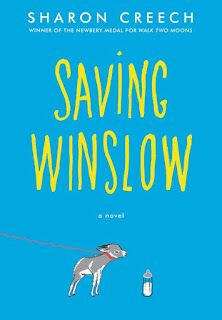 Saving Winslow has a cast of characters that are believable and relatable. Though the story's resolution is a bit predictable, the book has a quick and easy pace, and the plot feels natural, not overly dramatic. The author approaches the topic of death in a delicate, yet realistic way that is ideal for the middle grade audience. 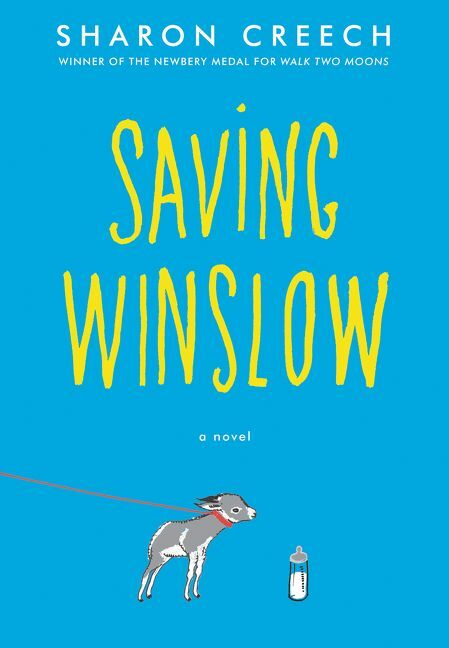 I recommend Saving Winslow for anyone who enjoys stories about relationships between children and animals, for those who has a soft spot for animals in general, and for people who enjoy simple, feel-good stories that make them smile (and maybe cry a little). If you enjoyed books like The One and Only Ivan by Katherine Applegate, Charlotte's Web by E.B. White, or any of Sharon Creech's earlier books, then you will enjoy Saving Winslow. Her books usually have that kind of effect on me.